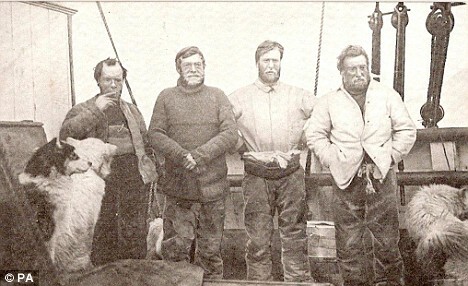 Shackleton (second from left) and his men. Image Source: Daily Mail. Spectres are not just found in haunted houses and ghost ships, or in abandoned temples and unquiet towns. The most fascinating stories are of apparitions arising in completely desperate circumstances, when the spirits are benevolent. The most famous story of this type concerns an Antarctic exploration expedition gone terribly wrong. It is a documented vision, observed by rational human beings pushed to the very brink of death. There is a peculiar line in The Waste Land (1922), which T. S. Eliot drew from the incredible story about how Sir Ernest Shakleton saved his men on an ill-fated 1915 expedition to Antarctica. Shakleton's ship, the Endurance, got trapped in the ice, broke up, and sank. The survivors were trapped on ice floes for some months. They finally reached Elephant Island; from there a small, half-starved scouting party had to sail in a lifeboat (through a hurricane) to South Georgia. They then had to climb a mountain for 36 hours to get to the side of the island where there was a whaling station at Stromness. It's one of the most incredible stories of exploration and survival the world has ever seen. As they climbed to safety, pushed past all reason, Shackleton could have sworn another man joined their party, and followed them until they reached help. They could see this shadowy figure out of the corners of their eyes. You can read more about Shackleton's amazing leadership and experience, here and here. This phenomenon is now called the 'Third Man factor.' In 2009, John G. Geiger expanded his 2008 article 'The Sensed Presence as a Coping Resource in Extreme Environments' into a book on this topic. It has also been equated by some with a 'guardian angel.' See the surprising number of cases below the jump. Exploration and Travel including the Polar Sale. Christie's Catalogue, September 22, 2010. 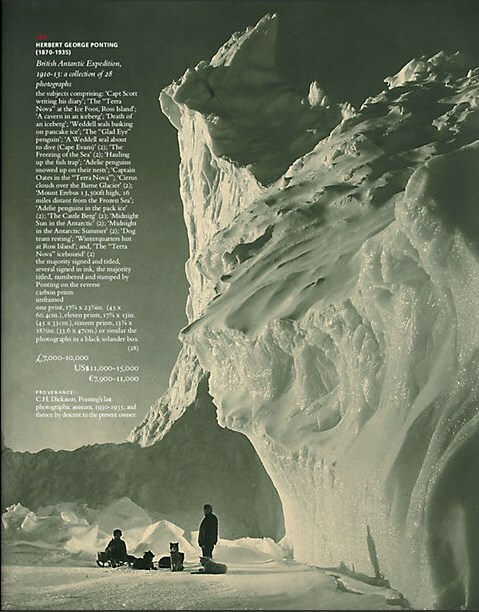 Dinosaurs and Robots recently reported that Christie's auction house in London is holding an auction today of images and paraphenalia from Robert Scott's ill-fated Terra Nova Expedition to Antarctica, 1910-1913. The photographs and objects originate from several estates, including the estate of one of Scott's surviving men, Canadian Charles Seymour [Silas] Wright, who was on the 1912 rescue team that discovered the bodies of Scott, Edward Wilson and Henry Bowers in their tent. Wright later returned to Antarctica in 1960 and 1965, when he was in his seventies. The auction catalogue is here; the Polar Sale starts on page 36; Wright's section begins on page 56. There's a picture of the whole crew on page 77. Feel like bidding? Go here.